Home > Windows Tips and Tricks > Do You Really Need to Safely Remove USB from Windows? Do You Really Need to Safely Remove USB from Windows? A lot of users have been warned for the importance of using Safely Remove before unplugging USB flash drive from Windows computer. However, do you know the reason behind? Is it really necessary to safely remove USB? Is USB Safely Remove good enough to prevent data loss or corruption? 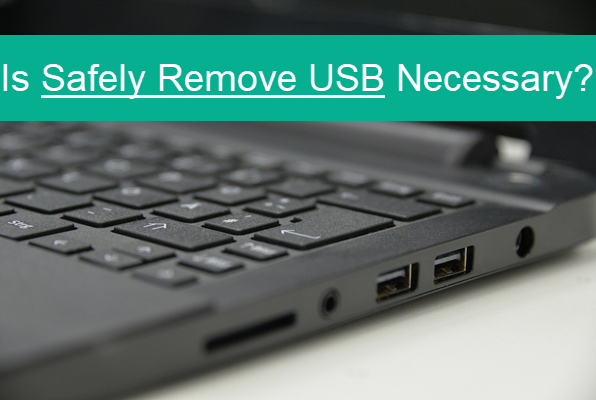 In this tutorial, you will learn everything about USB safely remove and Quick removal. Actually, it is up to the user to choose which option. USB flash drives have been widely used in worldwide for many years, and Windows OS has optimized its supporting services according to the features (no matter pros or cons) of USB drive. The biggest advantages of USB flash drive are its portability and compatibility. In this manner, Quick Removal will surely maximize the features. The performance of USB drive is usually not as good as computer internal hard drive. We can speed up USB drive by enabling write caching, but Better Performance must be selected and USB Safely Remove required. Luckily, Windows OS offers the two options available for users to choose according to specific needs, and it is considerately applicable for each removable drive separately. Right click on the This PC and select Manage. A new window will open, select Device Manager from the left pane. Expand Disk drive section, and locate the USB drive. Right click on the USB drive, and select Properties. Open Policies tab on the new window. You will see two options under Removal policy. You can choose any of the removal options according to the accompanying descriptions and the explanation above. Nevertheless, it is highly possible that some files could be lost even if you choose Quick Removal, especially when file transfer is interrupted. In case accidents happen to you, don’t hesitate to use Jihosoft File Recovery or Photo Recovery Software to get back your lost data. Part 2. How Does Write Caching Work for USB Safely Remove? 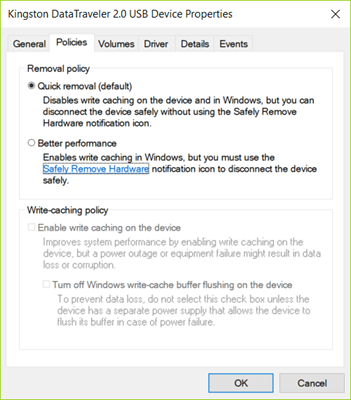 Write caching is available only when you select Better performance as the Removal policy for your USB drive. It is optional, but once enabled, it will improve the overall performance of USB drive by copying the data into the cache instead of writing it immediately the USB flash drive. In this way, users will find it much faster to transfer files to USB drives. However, write caching won’t last when accidents occur, such as power outage, drive failure or disconnection. Therefore, the original files could be lost or corrupted before being successfully written to the USB drive. Tip: Copy and Paste, instead of Cut and Paste, is suggested in order to avoid data loss or corruption in this case. The above-mentioned data loss will also happen if you select Better Performance but do not safely remove USB drive. Your data might not be copied to USB drive even all dialogue boxes are finished due to cache write up priority. When you eject the USB flash in this case, then the cache data will be flushed out after sending it to the hard disk storage with 100 % surety. Part 3. Will Quick Removal Avoid Data Loss or Corruption? In a comparative analysis of Quick Removal and Better performance, we know that Quick removal decreases the performance of USB drives in some aspects, and it doesn’t have the issue of write caching. However, does it really mean that data corruption or loss will not happen? Not exactly. If you remove the physical USB drive from your Windows PC while file transfer or a program associated with the removed USB drive is running, some of the data could still be lost or corrupted when you choose Quick removal. Note: Files lost from USB drives or due to failed transfer won’t go to Recycle bin. You will have to recover files from Windows 10/8/7 with tools mentioned in Part 1. Quick removal and Better performance are necessary for specific purposes. However, the real USB Safely Remove relies on users. In many cases, you may not get the idea that either the USB flash drive is in use or not. It may not apparently seem but it is in use, so data corruption & loss is common in that case. It is a good habit to always use Eject (right click in Windows Explorer) or Safely Remove Hardware and Eject Media (from taskbar) before trying to plug out your USB flash sticks. If you get the notification that the device is in use, make sure to check all possible items. It is possible that the computer keeps warning but you have checked all possible matters, then you can try fixing problem ejecting USB drive with several methods.